Everyone and their cousin recommended that I go to American Flatbreads if I’m in Burlington, and with good reason. This place is delicious! It’s also a great place to take friends, as the meals are pretty big and therefore good for sharing. The only issue I have with American Flatbreads is that the “flatbreads” they make are clearly pizzas, and they don’t even try to hide it. Even the little buzzer you hold while you’re waiting is a pizza! So, really, American Pizzas is pretty great. The restaurant also serves as a brewery, called Zero Gravity. I’ve had their draught and it’s very hoppy, which I like. 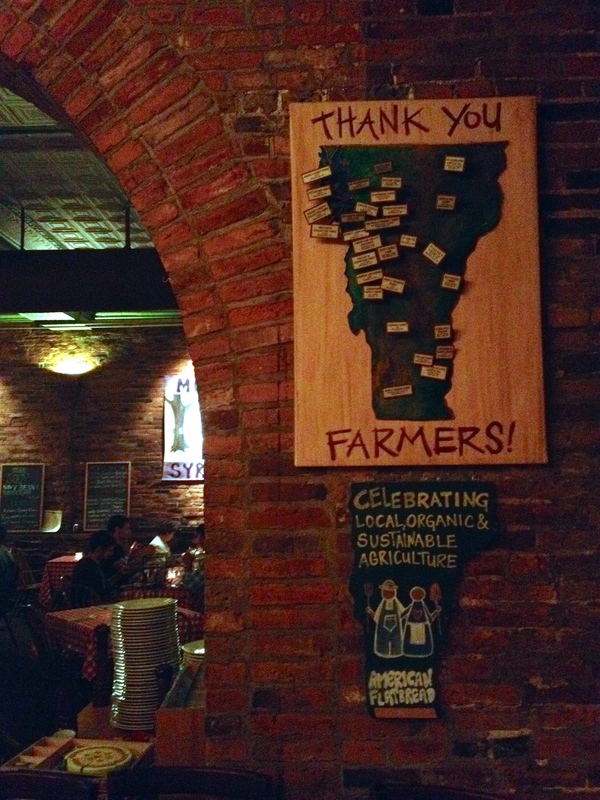 Vermont is known for having amazing microbrews, and most of them are IPAs (they are home of Magic Hat, after all). This was a pretty big change from New York, where the best beer bars had mostly stouts and porters on draught. My palette has definitely expanded, and I can’t honestly say which I like better than the other. I guess it depends on my mood! In a state known for bomb-diggity cheese, “flatbread” restaurants are out of this world good. Again, all the food is local and organic (they have signs everywhere reminding you), and you can definitely taste the difference. 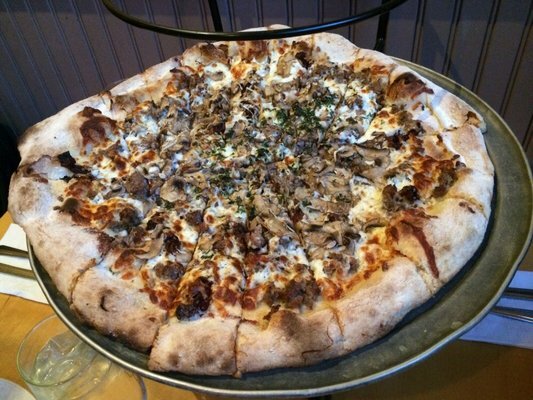 One of the topping choices, The Vermont Sausage, has Vermont-made goat’s cheese with farm-fresh pork, maple-fennel sausage, and caramelized onions. If that doesn’t make your mouth water, I don’t know what does. What’s my favorite thing here? Definitely the brunch menu. Mainly because the restaurant has an Eggs Benedict flatbread (pizza) that has hollandaise sauce all over it. Oh, it is so good. This would be another Top 5 Burlington Restaurants in my book.